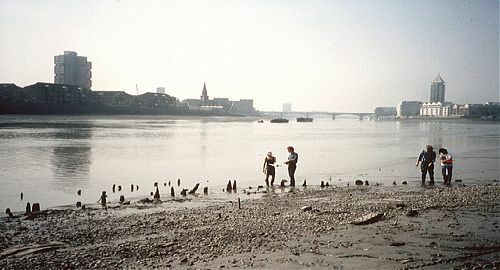 Archaeological features surviving at this site have been investigated in detail by the Thames Archaeological Survey and Museum of London Archaeology. The site is significant because of the surviving deposits, structures and artefacts which represent thousands of years of activity. These include the remains of a paleoenvironmental deposit which contains an extraordinary artefactual assemblage including a Neolithic wooden club or beater, lithics, ceramics and animal and human bones. Part of a Bronze Age trepanned skull was found in 2001 and two leg bones have been dated to the Bronze Age and Neolithic periods. A recent monitoring visit to the site by TDP found a third femur. Also on the site are two mid-Saxon fish traps and timbers representing post-medieval activity probably relating to the Greaves boatyard. Check out the articles below to learn more about Chelsea.